"Living Your Faith Out Loud"
One component of a faithful or religious life is knowing and articulating your beliefs and values. Kate Lannamann, President of the Florida Interfaith Coalition for Reproductive Health and Justice and long-time UU member, will share her journey as an advocate, supporter, and protector. It’s simple – bring a flower. Just one is enough. It can be your favorite flower, a flower from your own garden, a flower from your favorite place, a flower you pass on your way to Sunday Service or a flower from anywhere else. The beauty of this ritual is reflecting on the beautiful bouquets they make, together, and to see each flower as unique and as special as each person in our community. New members will be welcomed into our community during this service – adding to the beauty and richness of our congregation. Our membership team, led by Gina Busby, will lead the celebration. Plan to stay for Potluck after service to spend time with all the wonderful members of our community! April 2019 is a time of commemorations and celebrations, some of which last for the whole month—such as Humor Month and Poetry Month. Other special events last several days—such as Passover and Easter. And some hang around for just 24 hours—such as Tax Day, Earth Day and Atheist Day. But on Sunday, April 21, all these topics and more will be dealt with—and it will take less than 30 minutes to do it with, of course, much humor, grace and wisdom. Beverly Ward is the SEYM (Southeastern Yearly Meeting) Field Secretary for Earthcare for Quakers, or Friends, in Florida, Southeast Georgia, and coastal South Carolina. Friends feel a strong spiritual connection with Nature, and see all creation as sacred and are deeply concerned about Climate Change and finding ways to reduce mankind’s destruction of the environment. The challenge of climate change and living sustainably has at its root a spiritual issue: can humankind come to value all life over wealth and economic growth? Beverly will share with us the passion that guides her work on behalf of our world. Childcare for infants on up beginning at 9 a.m. Adult Religious Education "Inquiring Minds" at 9 a.m. Religious Education for Children Pre-K–5th at 9:30 a.m.
We are a "lay-led" congregation with a different speaker every Sunday morning. We hear from a wide variety of academic, spiritual, and social justice speakers. Our Sunday Services are designed to illuminate different spiritual paths and strengthen our sense of self, family, and community. 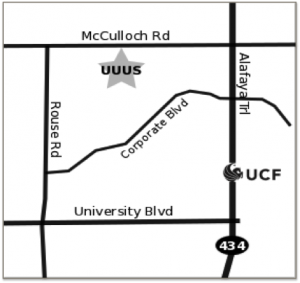 Note: UUUS is accessible only from McCulloch Rd. Some GPS and maps show a non-existent second entrance, so don't be fooled! Our Lifespan Religious Education program teaches adults and children about the great faiths of the world, social justice, wonders of the natural world, and ethical decision-making. We are a welcoming community! We welcome all to our Sunday services and programs — regardless of age, gender identity, race, ethnicity, religious beliefs, or sexual orientation. We invite you to visit...and we hope you will visit more than once, because each week offers a different speaker and a different focus. One thing is the same every week, though – our principles, values, and warm welcome!